The $1 billion project is breaking a lot of barriers with features like a 850-foot LED screen, the largest in the country, and a 100-foot, two-acre sky park. 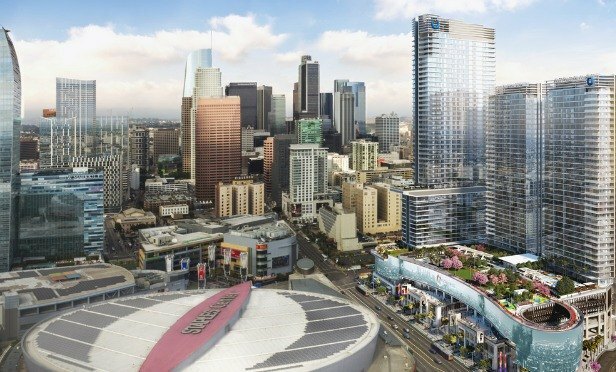 Oceanwide Plaza is aiming to be the brightest star among the development projects rising in Downtown Los Angeles. The $1 billion project is breaking barriers and setting records with features like a 850-foot LED screen, which will be the largest in the US and the third largest in the world, and a 100-foot, two-acre sky park. Oceanwide Plaza has also feature the first Park Hyatt-branded residences on the West Coast. The Park Hyatt will offer 164 luxury half-floor and duplex residences and penthouses, ranging in size from one to three bedrooms.